Frankincense is one of the biblical oils and referenced 52 times in the Bible. This oil is steam distilled from the resin/gum (hardened sap) of small trees grown in the Middle East and Africa. 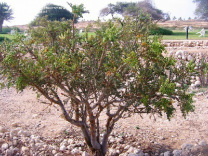 Frankincense is a close relative to Myrrh, sharing many of the same properties. Frankincense is one of the oils containing sesquiterpenes that can cross the blood/brain barrier as well as healing spiritual and emotional issues and supporting the immune system, nervous system and the skin. This is known as the most potent and healing of the Frankincense species and used with great success in the treatment of cancer, tumors and other diseases. Watch a short video clip here about this species. skin healing, sores, boils, scars, warts, etc. emotional oil used in meditation, spiritual uplift, dealing with loss, healing emotional wounds, uplifting the attitude and spirit, etc.